Keeping a room neutral and white can make a smaller space feel large, make a dark room feel bright, and make any room feel open and airy—even without a lot of windows. But while this trend has a lot of advantages, it can also feel bland and unfinished if poorly done. If you want to go for an all-white look, use these tips to ensure your space feels chic and elegant. The first step to a perfect neutral living room is picking the right couch, chairs, and accent furniture to complement your white walls. Stick with linen or off-white cotton fabric for your couches and sprinkle in warm rustic woods. This living space from Driven by Decor incorporates rattan and reclaimed wood to give this cream-colored room a welcoming and cozy feel. We also love the black-and-white prints that maintain the palette throughout the space. A white-washed, neutral room doesn't mean you have to give up all color. While the style is about keeping things simple and clean, sprinkling in a few pops of color can finish off the space and give a white room a stunning effect. This all-white kitchen is finished with red lamps for a pop of color. You can easily replicate this look by buying cheap lanterns and spray painting them to your heart's content. A boho-chic white bedroom with soft, romantic lighting looks effortlessly stunning. This white linen bedding and whitewashed rustic wood headboard are a Parisian dream when paired with the subtle twinkle lights. This Edison bulb bed sconce is also a super simple DIY—just stain a wooden shelving bracket, weave a pendant cord through and voilà! Another perk of an all-white bedroom is that unmade beds look intentional when everything is monochromatic. While you may think of white paint as that gallon you picked up before they mixed it at the hardware store, white actually comes in hundreds of shades. 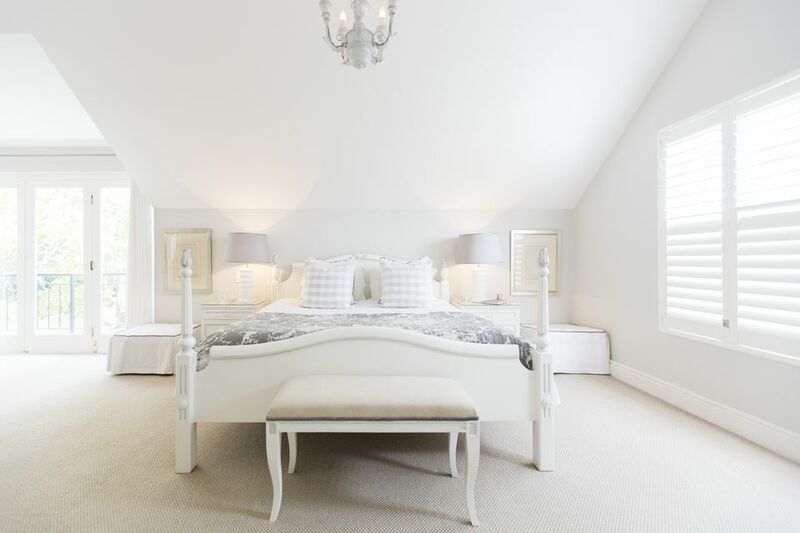 When deciding what color of white to paint your room, pay particular attention to the light. Rooms that have a lot of natural light, like this glorious vaulted bedroom, will give off a warm tone—and picking a cool shade of white with a blue or grey base can balance the hues. Similarly, a smaller, artificially lit room can benefit from warmer beige or cream tinted whites. Also consider that not all white matches, so be mindful of your furniture and accessories when picking a shade. Monochromatic rooms, especially white ones, can feel monotonous if not done correctly. Break up a white room by adding textures throughout. Between the brick, the wood, the cozy rug, and the coffee table and chair, this rustic bedroom room is anything but boring. Seek out throw pillows or blankets with rough, heavy or interesting textures to give an all-white room an eye-catching element. 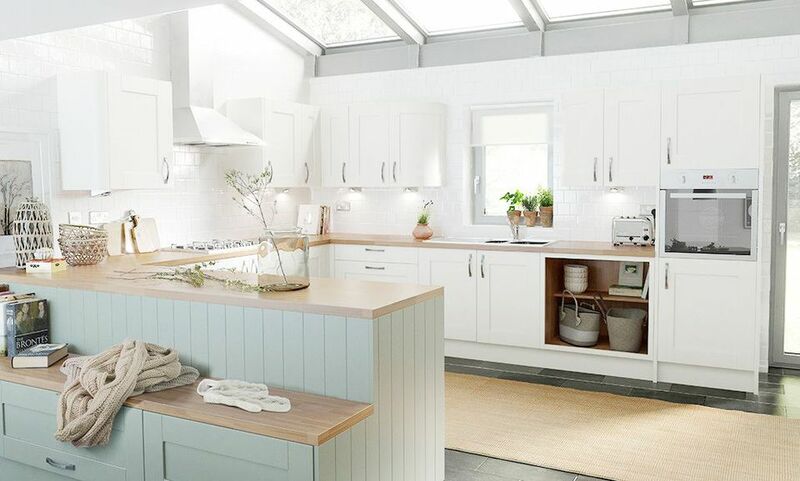 While all-white can work in nearly any room in your house, approach this look with a sense of reality. If you know you're a very messy cook, a white wallpapered backsplash or linen-covered bar stools in your kitchen probably aren't the best choice. Conversely, if you seek out a calming spa-like bathroom but your brightly colored shower curtain isn't doing it for you, switch to a white palette to rejuvenate the space. While all-white bedrooms may not work for a kids' room, they could be perfect for a master or guest room. Consider how you will use each room when deciding what decor style you want to incorporate. One way to really show off a beloved piece of art is to create a blank canvas in the rest of the room. The masterpiece hung over the bed in this stunning bedroom from Fresh Home really is a work of art—the entire room feels like an audience to the centerpiece. If you want a more subtle version of this look, blowing up black-and-white photographs or travel maps can add a punch that you can easily swap out on a whim. Filling your all-white room with lots of indoor plants provide a pop of color and feel incredibly fresh and airy. This neutral room uses the plants as its only source of bold color, giving the room a lively feel without being overwhelming. If you decide to renovate a room in white, choosing a distinctive pattern for one element of the room is an easy way to give the space a little more punch. This beautiful laundry room sticks with the white motif throughout, except in the boldly patterned flooring. This allows one to really appreciate gorgeous tile work without the distractions of a busy room. Try a ​graphic design in flooring, backsplash, shelving or simply add a rug to give a white space a vivid element. Confused About Mid-Century Modern, Contemporary, and Minimalist Décor?